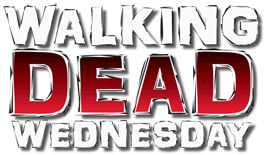 Walking Dead Wednesdays are back again! Hershel, in the comics, was a pretty non-descript guy - just a skinnier Dale with no hat. He was grumpy and unlikeable, and kicked everybody off his farm. The TV show made him more memorable, mainly by giving him an easy visual identifier: suspenders. Seriously, that's all it took to make him distinct. Well, that and being a live-action human with a different face. (The face of Pa Angel, in fact!) It also helped that he eventually grew a big Santa beard, which is something neither he nor Dale ever did in the comic. The eyes are sculpted in - that's the way other kinds of Mystery Minis do it, but the Walking Dead just painted them on in Series 1 and 2. 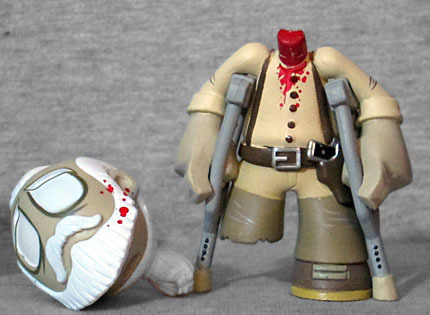 This figure represents Hershel from Season 4 - after he lost his leg (a story beat he inherited from Dale, because Dale was already dead). He's wearing a beige shirt, and his pants are two tones of tan; they were that way in the show, but not all the way around. Look at the scene where his leg is amputated, for example, and you'll see that the dark section is just on the fronts of the legs. It's a different fabric, for some reason. The toy simplifies things by just painting the dark color over the whole area. It was probably cheaper. Since the figure only has one leg, he's leaning on his crutches, which does make him a bit unstable - they can get a little warped while he's rattling around in the box. The holes in the crutches that, on real ones, would allow you to adjust the height are sculpted in, not just painted, and there's a pistol holstered on his belt. 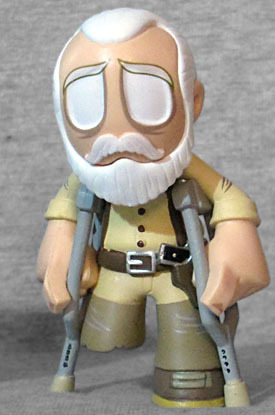 Hershel is one of the common figures in Series 3, available in a 1:12 ratio. There's also a chase variant, which depicts Hershel after being taken hostage by The Governor. Taken hostage, and then decapitated. Rather than being glued on securely, the head can be removed from the neck peg. He has some blood splattered on his face, and pouring from his neck. If you can get this 1:72 variant, you won't want to swap the head too often, because it can scrape the red paint very easily. Showing a great attention to detail, this one's skin is zombie-grey, rather than living-white-guy pink. I had the regular Hershel, and I thought it was awesome, but gave it to a major TWD fan I'm related to. They're both awesome. The fact that they went to the trouble of making a man on crutches? Too cool! I know! I kind of want another Hershel now - I used up almost all my TWD mystery minis on that relative's birthday.